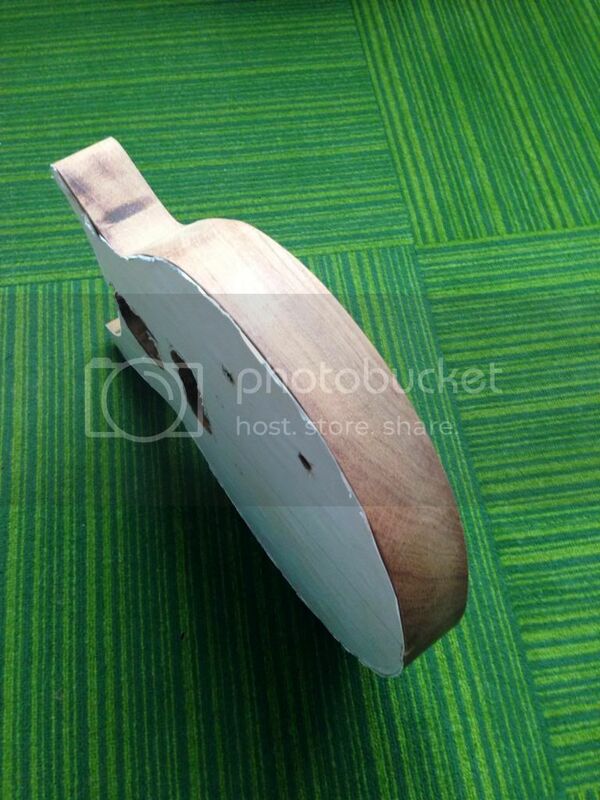 Discussion in 'Guitar Building' started by KnightroExpress, Feb 2, 2014. Hey all! I know it's been a while since I've made any significant progress on my first build thread, but this is what I've been working on lately. I call it Knightro JR! This is my design, done in eMachineshop. All cut out! Still needs actual routing done. And the side, to give some perspective on the thickness. And there you have it so far. 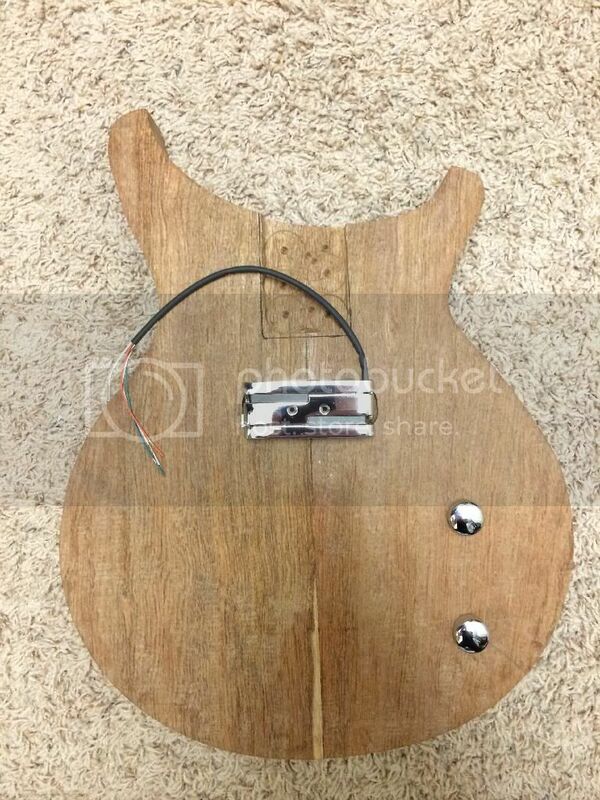 The body is still a bit over 9 pounds...no wonder I've never seen this stuff used for a guitar body before. 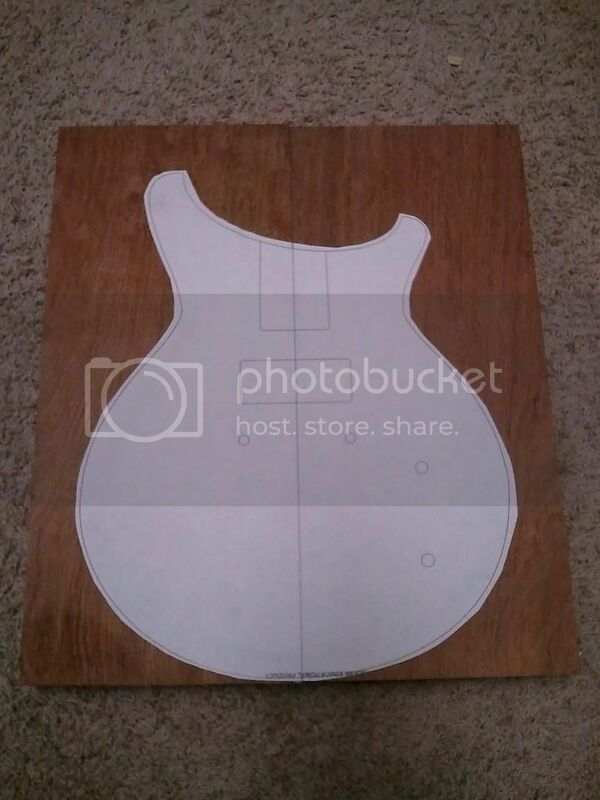 The neck I'm working on is also jatoba, so I'm pretty sure this is going to be a 12 pounder at the minimum. You could slim the body down to 35 or 40 mm to reduce weight? Nice design. 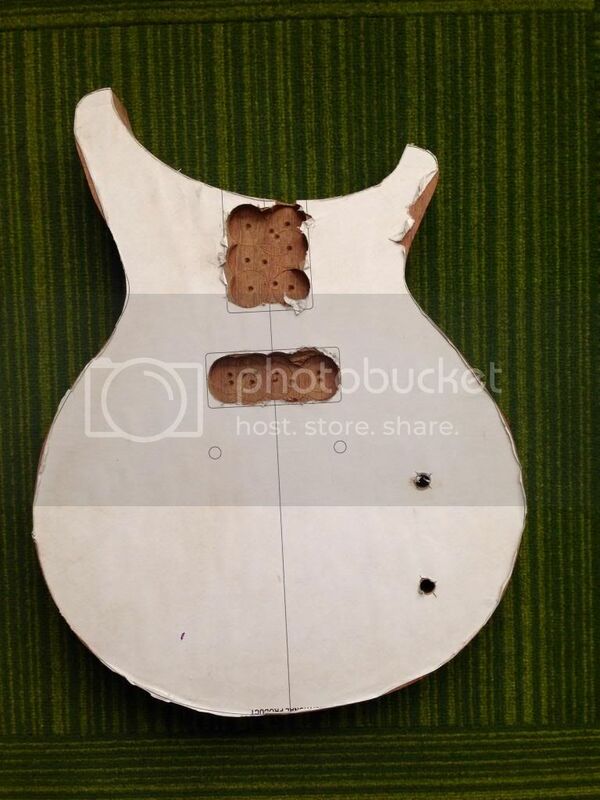 Personally I prefer a distance of around 8 mm from the outline of a 10 mm tuner hole to the outline of the headstock. Also the two E-string tuners could need some more space? You're welcome! Just my own reference point though! I really like it, great start. I like the body shape, for sure. Nice! That is a serious chunk of wood! 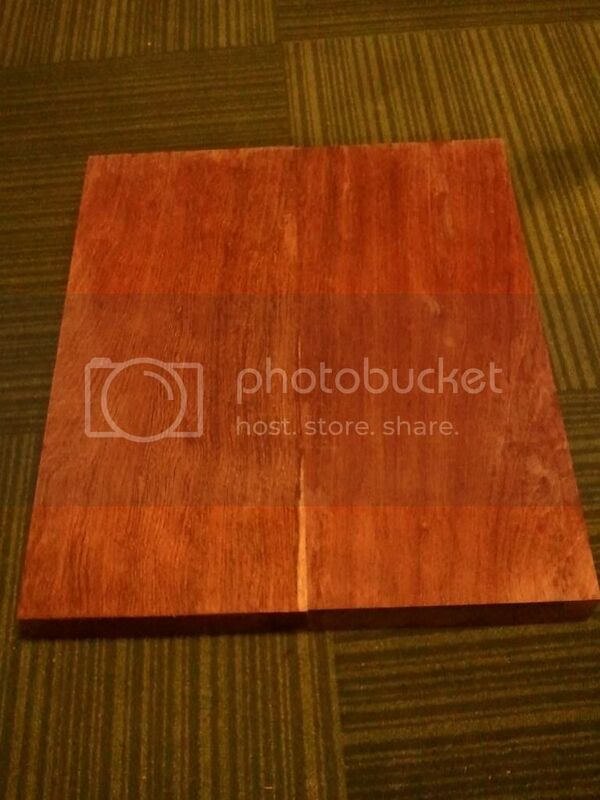 And I thought padauk was heavy. Oooh, an Alumitone? Also, I like the shape on the "horns". Reminds me of my Ibanez Roadstar. Yeah, this is pretty beefy. I like it though! I'm thinking about doing a huge roundover on the back side to reduce some of the felt thickness. Thank you! And yep, an Aluma-90. I've wanted to try one out for a while now, so I figured it's the right time. 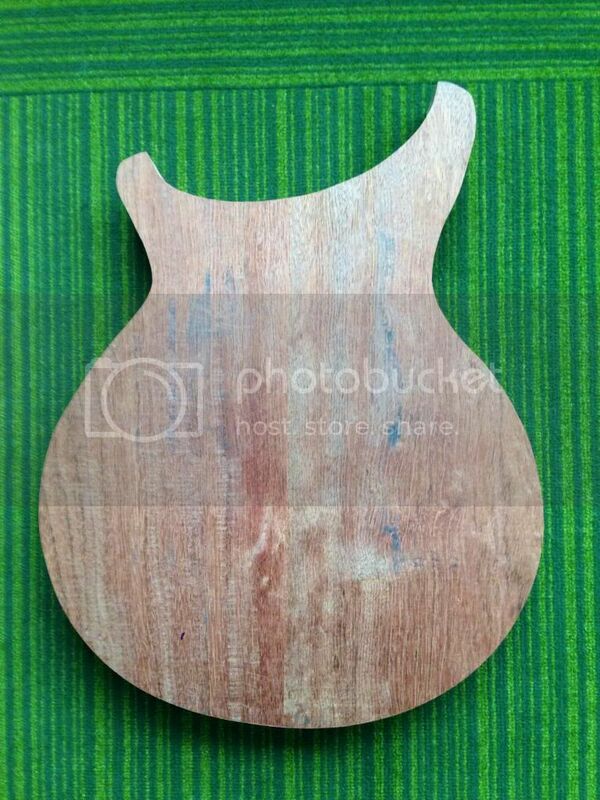 Love that shape - kind of junior-meets-rickenbacker...? Will be watching this one come together! Thank you for the kind words! I've always loved the Rickenbacker 4000 series and I didn't draw it in there on purpose, but I can totally see it now. I must have incorporated that subconsciously! New gear day! My Aluma 90 has arrived! This is easily the coolest looking pickup I have. With the knobs. 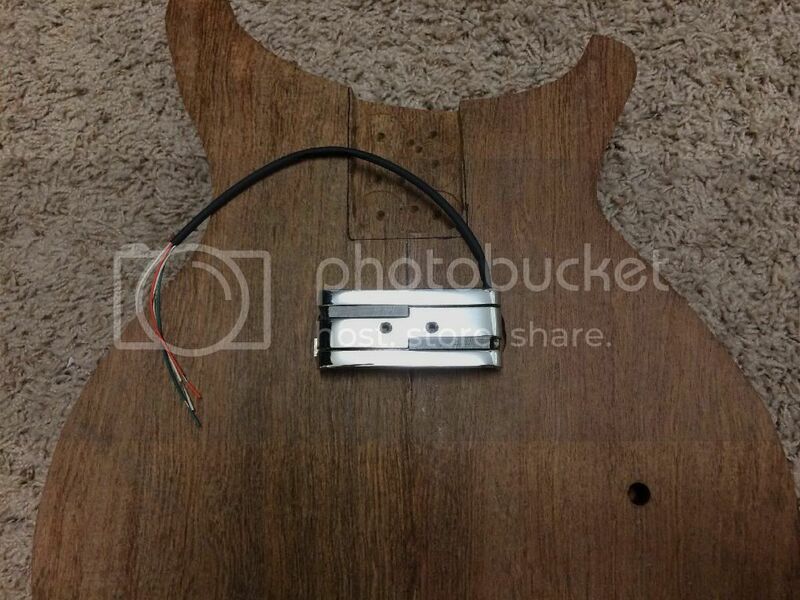 The bridge and tuners are chrome as well. 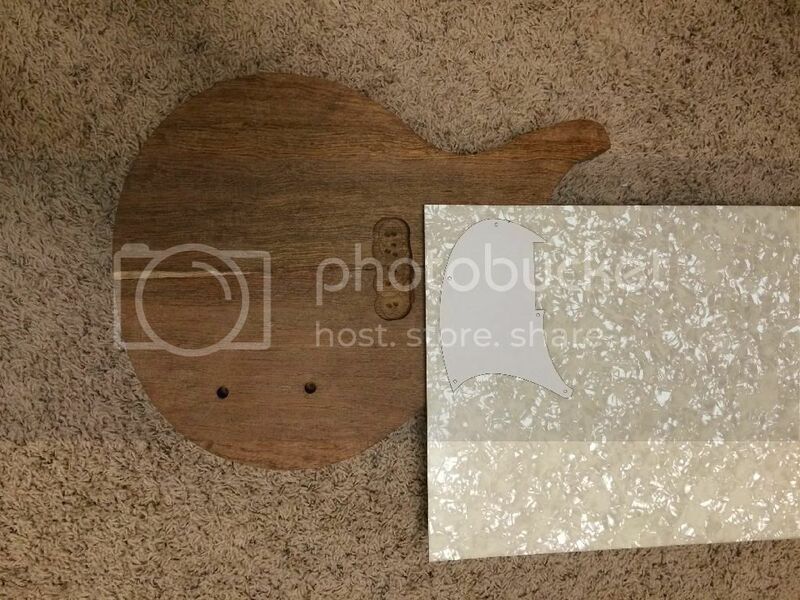 The pickguard is most likely gonna be white pearloid, but I'll see how it looks when it arrives. This is where I'm at so far. I love the little light streak on the bottom, I think it's a neat bit of character. I agree, I wish they would take the time to put up some nice demo clips. I'll be sure to record something when it's all done! Got my pearloid! I think it'll look pretty good. What do you guys think? I like it. I think it will go well with chrome.